Meadowleaf Beauty manufacturers their own Australian Tea Tree Oil. Tea tree oil is a very common natural oil that is used for a wide variety of skin afflictions such as athlete’s foot. Read on to learn if tea tree oil is right for you and your symptoms. Mellowleaf Beauty’s tea tree oil is 100% pure. Tea tree oil is considered to be an essential oil and many of those who believe in the power of essential oil will keep tea tree oil among their list of top oils. It is a very versatile oil and it is used for many kinds of skin afflictions including acne, warts, bug bites, wounds, and athlete’s foot. Many claim that tea tree oil has many properties including acting as an anti-fungal, antiviral and antibacterial agent. Mellowleaf Beauty claims that their oil works as well as 5% benzoyl peroxide when treating acne and it also claims to effectively treat all aspects of athlete’s foot. The dosage will vary depending on the use of the product. Mellowleaf Beauty suggests that you dilute the oil with water to determine your sensitivity to the oil. Following this, you may apply one drop on a cotton swap and then cover it in facial lotion before applying it to your face or the affected area. The directions for the use of tea tree oil for the treatment of athlete’s foot are not listed. This tea tree oil is listed as being 100% pure which means that it should always be diluted before applying it to your skin. You can dilute it in creams, lotions, shampoos or soaps by adding a few drops. Failure to dilute the oil may result in rashes, irritation, itching or swelling. Be sure to follow the manufacturer’s instructions when using this product. This product is designed for topical use only. If you accidentally ingest this product, inform your doctor immediately as tea tree oil may be toxic when ingested. Side effects of ingesting tea tree oil may include confusion, dizziness, inability to walk or a coma. There is some concern about the use of tea tree oil in conjunction with lavender on the skin of young boys who have not yet reached puberty. There is a possibility that these two oils may cause abnormal breast development in young boys. If you are pregnant or breastfeeding, consult your doctor before you use this product. 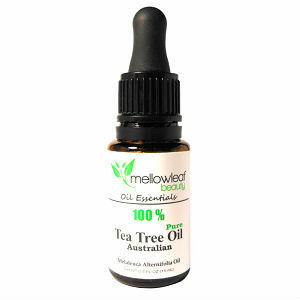 A bottle of tea tree oil from Mellowleaf Beauty will cost $16.97 for a 15 ml bottle on Amazon. This price is reduced from the $47.50 price that is set by the manufacturer. Mellowleaf Beauty offers a 30-day money back guarantee in which they will refund your money if you are unhappy with their product. There are several positive reviews on Amazon. However, many of these reviewers use this as a general oil product and not specifically for the treatment of fungal infections such as athlete’s foot. The guarantee offered by Mellowleaf Beauty shows that they are confident in their product. However, while they list that it is useful for fungal infections such as athlete’s foot, they do not list the directions for using it to treat these infections. There is also no timeline in which to notice the results of the product. The product is also very expensive unless it has been marked down by Amazon. Jimmy Rodriguez	reviewed Mellowleaf Beauty Tea Tree Oil	on June 7th	 and gave it a rating of 3.